Mix and Chic: Home tour- A bold and striking Park Avenue apartment! 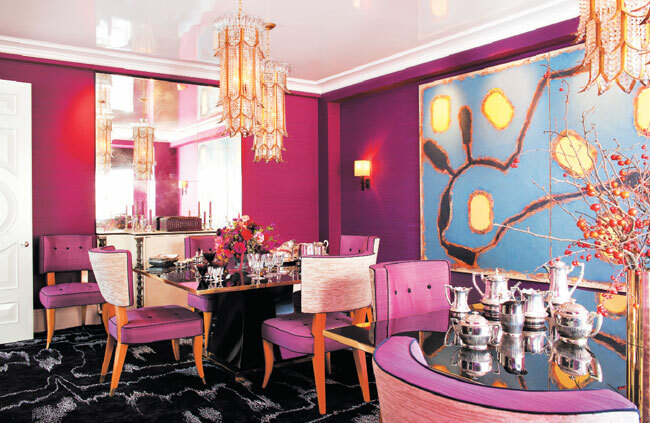 Home tour- A bold and striking Park Avenue apartment! This gorgeous Park Avenue apartment is designed by the talented Amanda Nisbet. Her fearless use of colors and textures set the rooms' overall mood and feel. Let's take a look! Amanda Nisbet is definitely gifted when it comes to using strong, bold color palette in a home. Each rooms are beautiful in their own way but the cocoon-like blue library is my most favorite. I also love the bright chartreuse pleather banquette in the kitchen. Which room are you most drawn to and why? I love the coffee table in first photo.. kids would love to crawl thru the middle whole and the color purple used in some of the photos looks so cool! Oh definitely that kitchen in the last pic! Ohmygosh the colors in there are AMAZING!!! ahhhhh, the photo in the first image! knockout!